That was the answer I came up with when I asked myself why I should sign up for the 75-Day Holiday Transformation Challenge. I have struggled with self-acceptance and obesity pretty much my entire life. For the past 10+ years I have gone on low-fat/low-carb/low-sugar diets and worked out with various personal trainers only to obtain temporary results. I longed for that moment in my life when I could exercise and eat healthier because I wanted to and not because I had to. I was an emotional eater; addicted to simple carbs and sugar and I had no idea how to change it. So I decided to take action and reached out to Brien Shamp about doing the 21-Day Detox. While on the detox, I was introduced to primal eating and learned so much in a short amount of time. Aside from losing 13 pounds and gaining an impressive amount of energy I also learned to connect with my mind and body by following the 6 Primal Needs. After completing the detox, I tried to continue those same habits, but it was not easy. 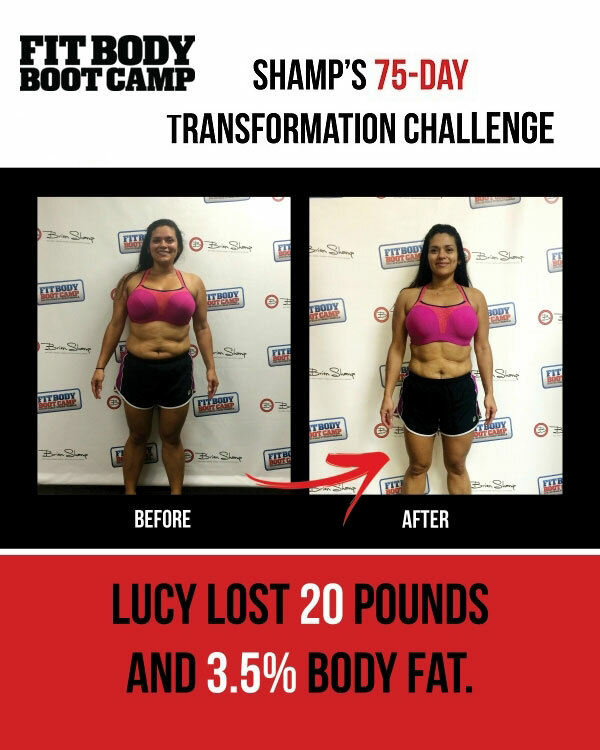 When the 75-Day Transformation Challenge was announced, I was afraid to sign-up as I wasn’t sure I could complete it. 75 Days seemed like an eternity, but I remembered how great I felt while on the Detox Program and I was not willing to let that feeling go. So I decided to sign up for the challenge in spite of the negative conversations in my head and I couldn’t have made a better decision. Learned to make myself a priority, appreciate myself and all my efforts no matter how small. Follow a primal nutrition more consistently. Increased my energy level by at least 80%. Significantly reduced my sugar and simple carb cravings (I can now say I am no longer addicted to sugar). Lost 20 pounds and 3.5% body fat. Following a high healthy fat, organic, low-carb, grain/dairy/sugar/gluten-free nutritional program 70-80% of the time. Drinking an average of 100-120 oz of purified/filtered water (or more). Attending 5:30am bootcamp sessions 5-6 days a week (except for 3 weeks when I attended 3-4 times). Going to bed by 8:30pm every day (except for Fri & Sat). Journaling my food intake at least every 2 days. Fasting with Bulletproof Coffee 2-3 Days per week. Ignoring people’s negative comments about my food choices and my appearance as the weight came off. Making time to journal my daily food intake. Keep myself moving forward in spite of my falls. Through this challenge I have learned that it doesn’t matter how many times I fall. What matters is that I don’t lose sight of my goal, get up as many times as I need to and keep moving forward. That I must celebrate every progress no matter how small it may seem. That I won’t always have the support and understanding of my loved ones, but as long as I know the “why” to what it is that I’m doing, that is all that matters. But most important that I am worthy of living a healthy and happy life and that investing time and effort on my wellness is the best gift I can give to myself. Finally, I hope that by being the change, I can inspire others who face the same struggles I have to make themselves a priority.